So, I decided to try another Merfolk Skald without forgetting Irfanview this time. Skalds are mage-warrior hybrids who focus on enchantment type spells. They used to be called Crusaders before patch .9 (I think it was .9), and their gimmick is heavy reliance on self buffs. During the early game they end to be weaker than their pure build fighter counterparts because they need to divide their resources between a lot of skills, but by mid game the utility from their buffs far outweighs the marginally better fighting ability of pure melee classes. Since LordSloth is covering Fedhas I'm going to go a more traditional route for god choice. I'm going to keep the early part of the game rather sparse since you're likely to see a ton of it and quite frankly it's not interesting. Let's go ahead and start and the Temple and go from there. Oh, also I will be playing in ASCII because Webtiles both doesn't have a trunk (beta of the next version) build and is on the CDO server which means its terribly laggy for me. More importantly though is the trunk build because it adds a bunch of cool stuff. The most important of which is a new branch, the Spider Nest. The Spider Nest used to be a timed portal vault, but .11 made it into its own full fledged branch and can replace I believe snake pit (though it might be swamps or both). As you can guess, it's full of spiders. I'm hoping to roll it up so I can show it off. So to start with, I'm going to worship Kikubaaqudgha (Kiku). He's the god of necromancy and gives you cool books and either a sweet weapon brand or the Necronomicon when you hit 6 stars. 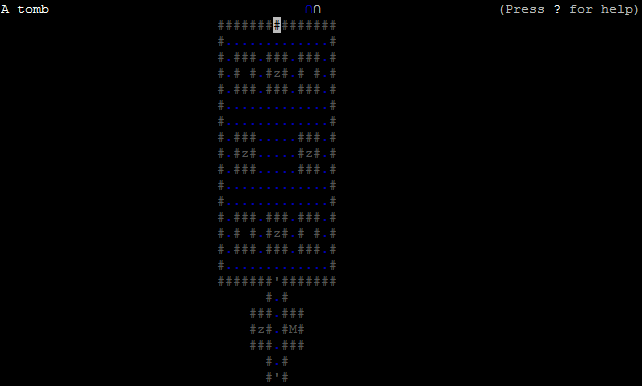 Fake Edit: I just realized I'm probably the first person to post an ASCII run through. I'll go see if I can dig up my conversion key so screen shots actually make sense to people. Fake Editx2: I'll probably post it later, it's late here and I'm going to bed. 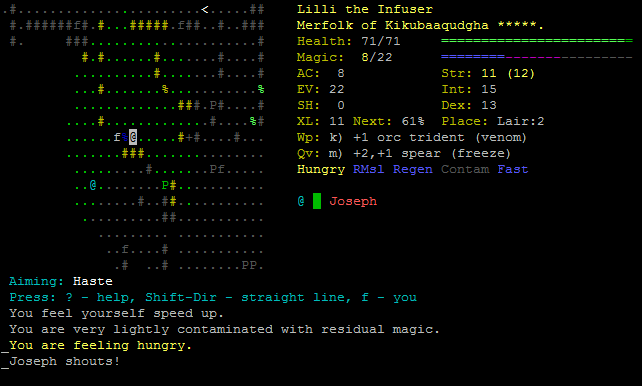 I found a large shield somewhere around Dungeon 8/9 and I threw it on since to see how bad the effects would be on my spell casting. 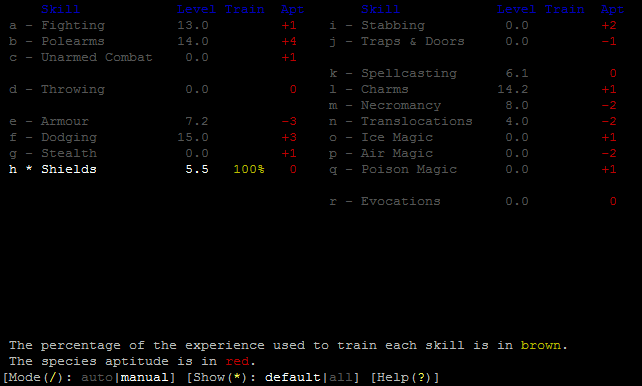 I went from something like a 4% failure rate or less to 100% on all of my spells, fun. I would have left it on anyways to train my shield skill (I could eventually remove the spellcasting penalty entirely), but I found a book that had haste in it and started pumping everything into my enchantment skill again. Haste is the best spell in the game, it lets you take 1.5x as many actions a turn whichs helps immensely both when trying to run away from things and when fighting. The only real draw back is that it causes you to accumulate magical contamination over time and that can be extremely dangerous (causes negative mutations/large amounts of damage) so you have to cast it wisely. 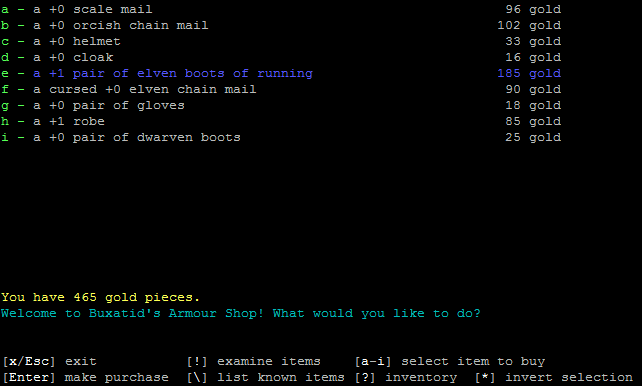 Annnnnnnnnd I just found boots of running. One of the cool things about polearms after .10 is that they all innately have the ability to reach (attack from two squares away). These boots mean I can kite most early game enemies and slowly poke them to death. It will be very, very helpful for some of the scarier hard hitting monsters we'll run into. This combined with haste or swiftness (which I hope to find) will basically give me the ability to kite anything. This one is for some of the vets, I haven't seen this mortuary before, but there were flying skulls and guardian mummies behind glass windows, is there someway for them to get out or is it just a bunch of free loot? Casting haste! Murdering Joseph! This is basically the way you fight almost every unique you come across as a skald, you throw up all your relevant buffs and go to town on someone. 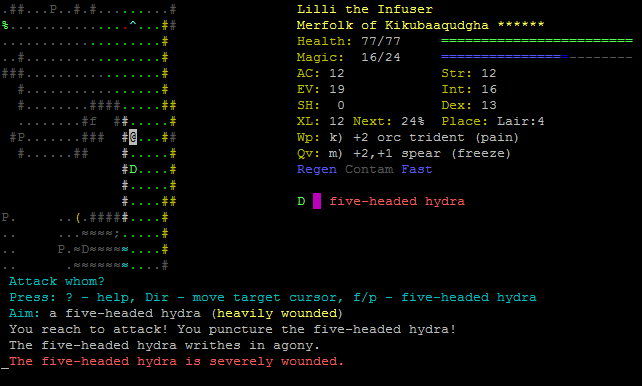 In this case I've cast poison weapon, a spell that gives me the venom brand, reflect missiles to lower his chance to hit me from range, regeneration which causes me to heal 1 hp a turn, and haste which I already talked about. 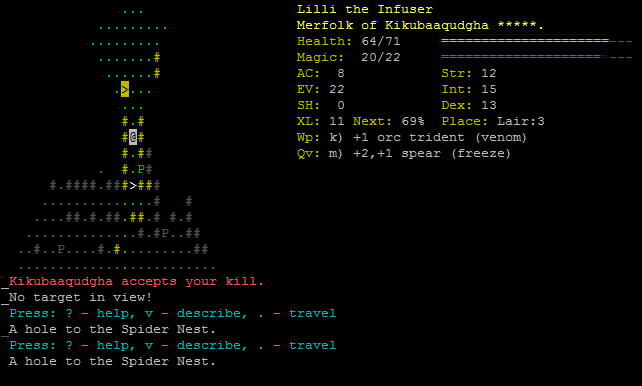 Yesss, I did get the Spider's Nest, awesome. No way I'm going in there without resist poison though. 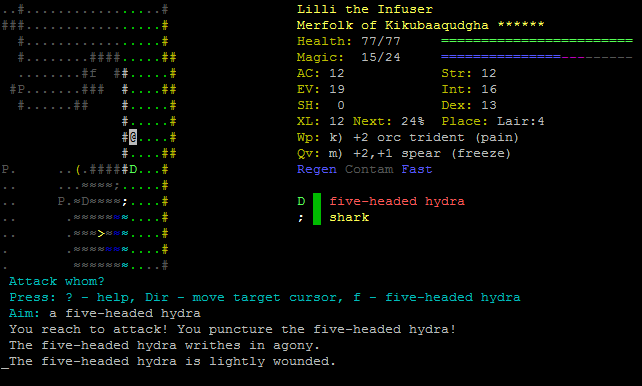 Previously I had come across a few hydras that I was running away from because my haste wasn't reliable enough and I didn't want to risk kiting them. However it's good enough now that I pretty much entirely neuter one of the most dangerous monsters in the lair by stepping back and repeatedly stabbing it. Also I apparently forgot to take a screen shot of it, but I hit 6 stars of piety with Kiku and enchanted the trident I was carrying around with Pain. Pain is easily one of the best non extended end game brands if you have any levels of necromancy. 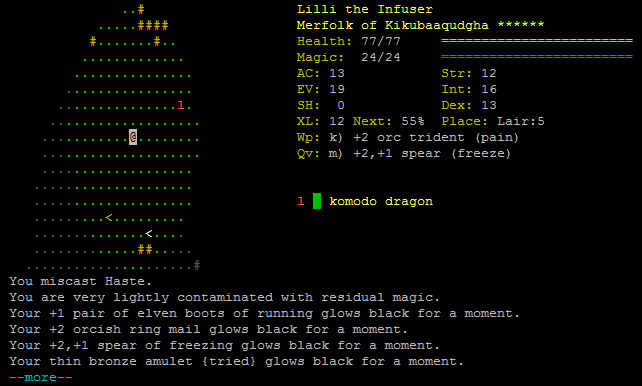 The brand triggers your necromancy skill/8 times (so with it at 8 it triggers on all attacks), and does 1d(skill) damage. It adds a pretty good chunk of damage when you're swinging your weapon 3 times in a turn. 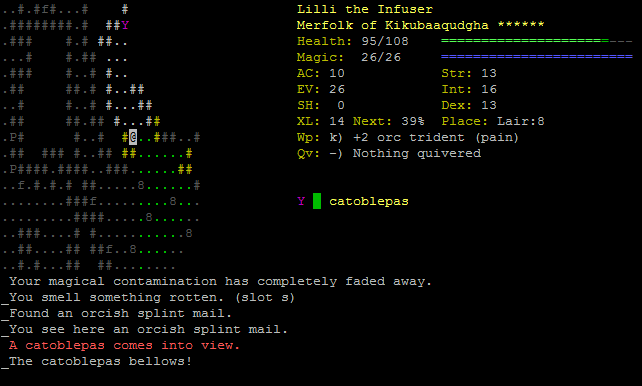 I miscast haste and it decides to curse all my gear in revenge, it's one of the annoying enchantment (technically they're called charms, but whatever) miscast effects. 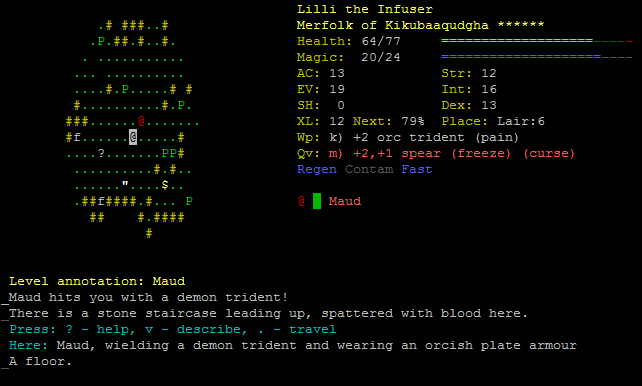 Maud is one of those lovely late-early game uniques that comes with too good of a weapon for their own good. I really want this demon trident for later on since this trident of pain won't last me all game. Annnd immediately after killing Maud, Rupert shows up around the corner. 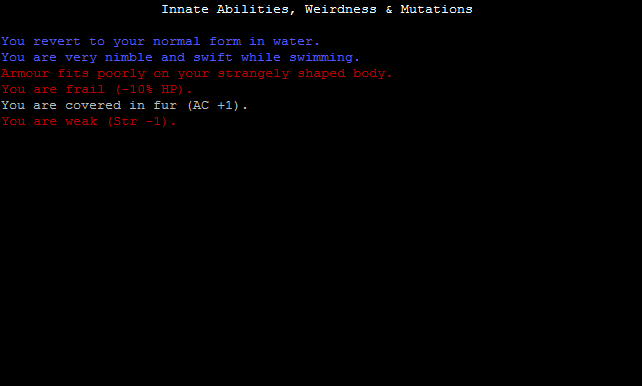 He's a very annoying unique who has the ability to cast paralysis. If it lands on you it can be a death sentence, luckily he cast it at max range so I came to before he reached me and fled upstairs. He can also go berserk which makes him very threatening in melee. After healing and buffing I go back down stairs to fight him. I end up abusing my move speed to kite him around and slowly stab him to death. 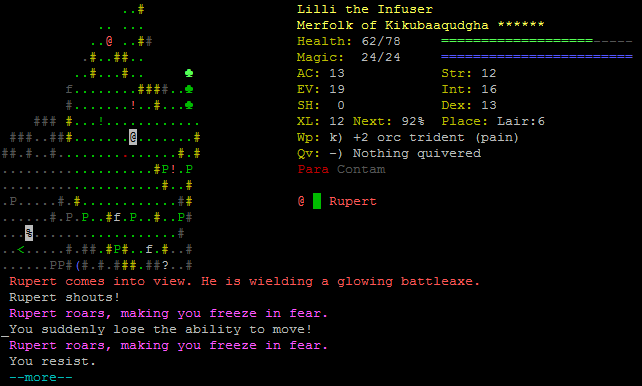 Luckily I resist the only paralysis he cast at me. This is unfortunately what happens when you don't watch your contamination. You'll start racking up mutations very quickly. 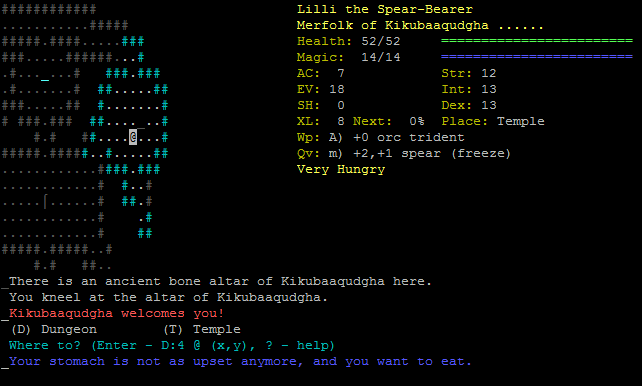 On lair 8 I get the elephant vault. I don't remember ever seeing this in .9, so I think it came out in version .10 or .11. Regardless, it features all the nasty Y's you can meet in the lair, Yaks, Death Yaks, Elephants, and the new to .11 Catoblepas. They're basically a death yak with a breath attack that petrifies you if you spend more than a turn in it. Make sure you have some maneuvering room wherever you fight them. After clearing it out by abusing haste kiting I finally find a shield that isn't waaaaaay too big. I've been looking for a shield or buckler to use so this is an awesome find. There wasn't anything else of note here, but this is good enough for me. It will let me train my shield skill up without absolutely killing my melee or spell casting, so I can eventually use something worthwhile. After all of that this is what my skill set looks like. Skalds have a number of different attributes they really need to be leveling. Their weapon skill of choice is an absolute must, and I almost always get my weapon to minimum delay before doing anything else. The various defensive skills, fighting, dodging, armour, and shields are all very important since you'll be spending a lot of time in melee. I tend to put armour in a very, very secondary position relative to dodging and shields since Merfolk have such terrible aptitude for it. Fighting also has the benefit of making you better in melee combat, so that's nice. 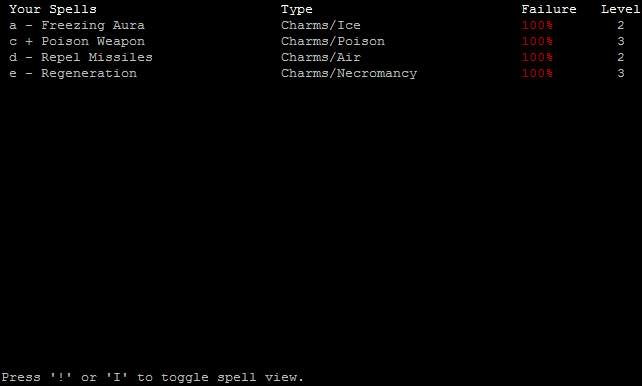 Finally you have the spelcasting components, you'll need a little bit of actual spellcasting to get all the spell levels you need, but mana generally won't be an issue so you don't need to raise it much further. Charms you should bring up to around ~14 so haste doesn't fail you at a critical moment. 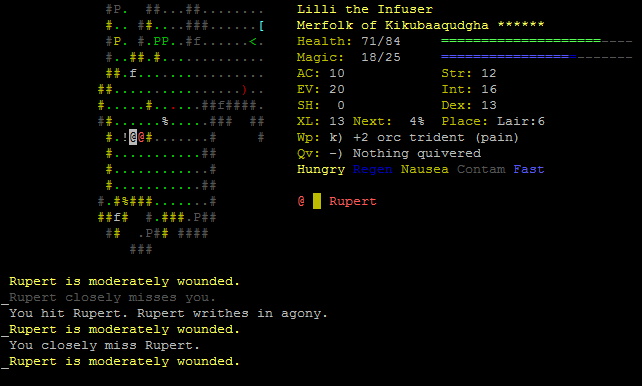 I leveled up necromancy to 8 and then stopped since that was all I needed to make my pain brand effective. 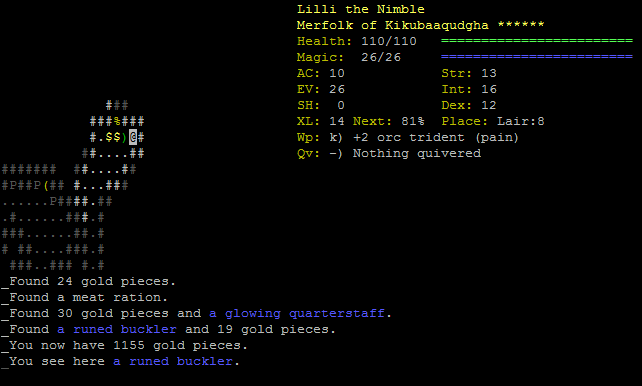 At this point I can really start leveling up anything interesting I find. Merfolk have good aptitudes for ice magic so I could eventually learn ice storm or freezing cloud, and I definitely want to learn controlled blink eventually so I'll need translocations. If I don't really find any spells worth casting I can just continue to level up my melee stats to become an absolute monster in melee. And this is the gear I've got on me right now, nothing really special though. 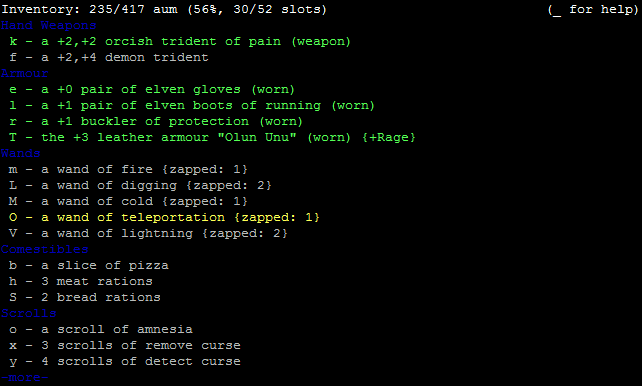 I'd really like to find a wand of healing, but no luck with that so far.